Le Grotte del Funaro restaurant is a special place, being entirely underground in Etruscan caves, and characterized by this unique environment. 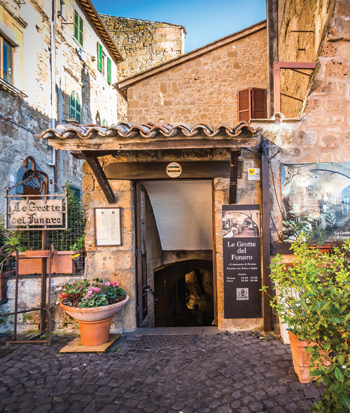 Our restaurant is located in the medieval quarter of Orvieto, in Piazza San Giovanni, near the elevator that connects Orvieto center with the Campo della Fiera parking lot. Originally these caves were used as a rope making workshop. In the late seventies, Sandra and Alfredo Branca turned them into a delightful restaurant, which they still run with their son Andrea. Our aim is to satisfy customers through the best choices of great traditional Umbrian cuisine. We serve excellent grilled meats, fragrant pizzas cooked in a wood oven, handmade pastas and homemade desserts. Our chef prepares the pasta right before your eyes. Everything is accompanied by a wide selection of local and national Italian wines a list of over three hundred labels. The restaurant is on several levels, and all the rooms are comfortable and full of charm. We have a summer veranda where you can eat outside. Come and visit us at the restaurant Le Grotte del Funaro, where every occasion is the right one to treat yourself with enjoyment and wonderful flavors.